Gifts are a wonderful tradition. Wherever you may come from, people give and receive gifts for different reasons. They come in various forms, too. Birthdays, weddings, christenings, graduations, holidays like Christmas, and other accomplishments often involve gift-giving. Wouldn’t it be great if you had a dedicated fixture for storing and holding the gifts given to you during parties and celebrations? Sure, any regular tabletop will do - but where’s the fun in that? This is where our beloved offering, the White Postbox, comes in. This brand new product from MJ Castles looks like a traditional British postbox. Whatever the occasion, this postbox will serve well as a place to keep gift boxes, gift bags, and even cards while the party is still going on. Plus, it is very aesthetically pleasing. It has a universal appeal to it, which makes it fit in no matter what theme and decoration you’re having. It certainly adds more to a party than an ordinary table would. In fact, it can be considered a decoration on its own even if it didn’t function as a gift storage unit. The postbox also includes a small photo frame out front where you can place a picture or card. You can place an invitation, here, too. You may place a photo of the person or family you’re celebrating, or simply a card that contains information about your event. At the end of the event, you can easily access the inside storage through the back side of the postbox using a lock and key. Once the guests have left and the party is over, it’ll be nice to take a look at what gifts you’ve received. Reading through greeting cards and letters will be a nice bonus, too. 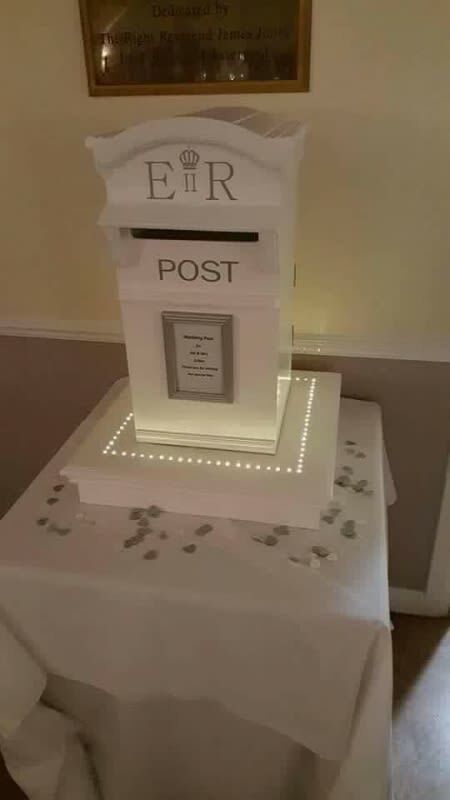 Make your celebration more meaningful by renting out this postbox. Each postbox costs £50 a day, but you can get discounted prices if you rent it for longer. Also, we’ll deliver the item right at the venue and pick it up once you’re done. The postbox can only be used in indoor venues, though. There is no need for complicated installation. We’ll handle everything for you, too. Simply give us the location and you’re set. Another good news is that you can book online now. No need to get out of your way and trouble yourself. We’ll take care of all your party needs for you. MJ Castles also carries a huge array of other party favors. Anything your celebration requires, we’ve got it. From bouncy castles to indoor and outdoor games to adult assault courses, there’s nothing we don’t offer. If you’re looking for a way to vamp up your event, our products are just the thing you need. Feel free to browse through our offerings and find which will fit your party the best. For more information, do send us an email, call us, or simply head over to the Contact Us page. We’ll respond to your query as soon as possible! Looking forward to seeing you at your next event!